Taylor Stone brings clear and decisive vision to her art. Her work ranges from whimsical cactuses set in tiny flower pots to large format hanging art and illustrated stationery. She builds her art out of layers of cut paper assembled with careful attention to light and shadow, depth and texture. As a student at the Martha’s Vineyard Regional High School, Taylor learned about the Savannah College of Art and Design, she applied and was accepted. Her choice to pursue cut paper as a primary medium came about more gradually – she majored in illustration and began working in printmaking, which she says is very similar to working with cut paper. “You have to think layer by layer and plan the whole process,” she says about both media. Taylor’s parents live on the Island, as well; her mother is a fiber artist and her father is an accountant. “I guess that’s where the very methodical step-by-step approach comes into my whimsy,” she says. “Its a lot of fun. I actually do really enjoy the cutting just like I enjoyed carving the woodblocks when I was printing.” In her senior year of college she did all of her assignments in cut paper just to be sure that she could make it work. She cites several illustrators – Quentin Blake, Jon Klassen, and Shel Silverstein – as artistic influences, along with filmmaker Hayao Miyazaki. 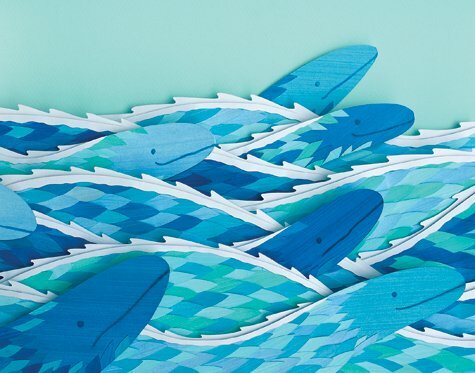 Cut paper art is difficult to mass-produce as it has to be assembled by hand. Because each piece is so time-consuming, Taylor makes prints of some of her work. Last year, she made a limited edition poetry book with laser-cut images of flowers. “I wanted it to be a spoof on a research journal,” she says. The paper for the cover contains flowers and leaves and was hand-made by local paper artist Sandy Bernat of Seastone Papers in West Tisbury. She also does custom work, she created a graphic for the Spectrum Film Festival at the Martha’s Vineyard Film Society to use this spring. The frames of film in the picture were made of painted velum. Brushing the color on gives Taylor more complete control over the shades, which can be tricky to get right even with the impressive array of paper in her flat file cabinet. “Whenever I find paper I buy it,” she says, adding that she does get a lot of it through her part-time employer, Educomp.